Guests online also complained about the lack of heating in the Buddhist temple, the absence of English tour guides, and “basic and vegetarian” food. In an interview with the Guardian, Buddhist monk Daniel Kimura promised to “tone down” his comments in future and said he regretted swearing in his responses. I stayed in a couple of shukubo (宿坊) earlier this year. Shukubo are temple lodgings for pilgrims, usually simple and plain by design. And yes, the food served is usually vegetarian - often it’s shojin ryori (精進料理), Buddhist temple food prepared to strict and fascinating guidelines. Shojin ryori probably is unlike anything the visitor had ever had before. 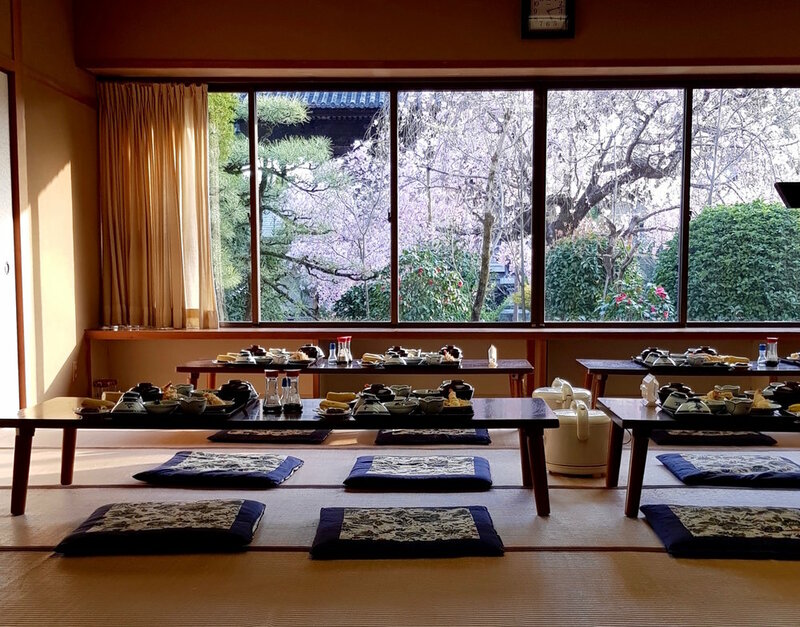 Breakfast at shousanji (焼山寺), temple number 12. A key principle of shojin ryori, which literally means “devotional cuisine”, is that it is prepared without any animal products. This is grounded in the Buddhist principle of ahimsa, compassion for all living things. Traditionally, shojin ryori doesn't use eggs or dairy either, meaning it’s often vegan. 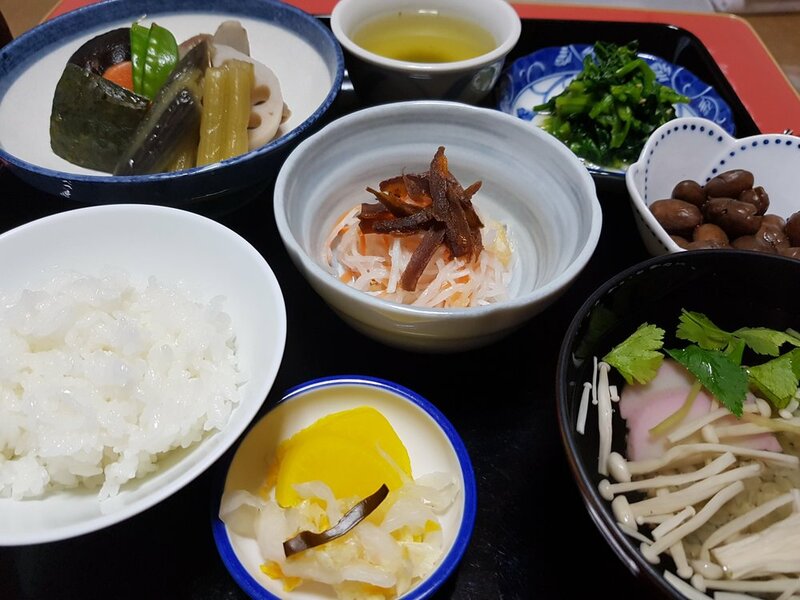 When you consider that truly vegetarian food is not that easy to find in Japan, where many meals contain dashi fish stock, the fact that many temples serve vegan food is pretty interesting. Shojin ryori also follows the “rule of five”: every meal must offer five colours (green, yellow, red, black, and white) as well as five flavours (sweet, spicy, sour, bitter, and salty). This guarantees a wide variety different vegetable-based ingredients. And seasonal vegetables are used – so it’s fresh, as well as healthy. Garlic, onions and other pungent flavours are prohibited in shojin ryori. Instead of fish stock, seaweed or vegetable stock is used. This gives it a really delicate flavour, I think. Protein tends to come in the form of beans and tofu. I stayed in three temples on my spring trip to Shikoku. I’m not vegetarian now, but I was for over ten years, and I love vegetarian food. And I loved shojin ryori. Dinner at shousan-ji (焼山寺). Can you spot the five colours (green, yellow, red, black, and white)? dinner in the dining hall at juraku-ji (十楽寺), temple number 7. Some people abstain from alcohol while on the pilgrimage, but in this temple you could get beer or sake with dinner. Breakfast at tatsue-ji (立江寺), temple 19. i ate with a nice dutch couple who were touring japan for the first time. they loved everything except the ‘terrible coffee’! the food at tatsue-ji was meat-free, but with some fish ingredients. 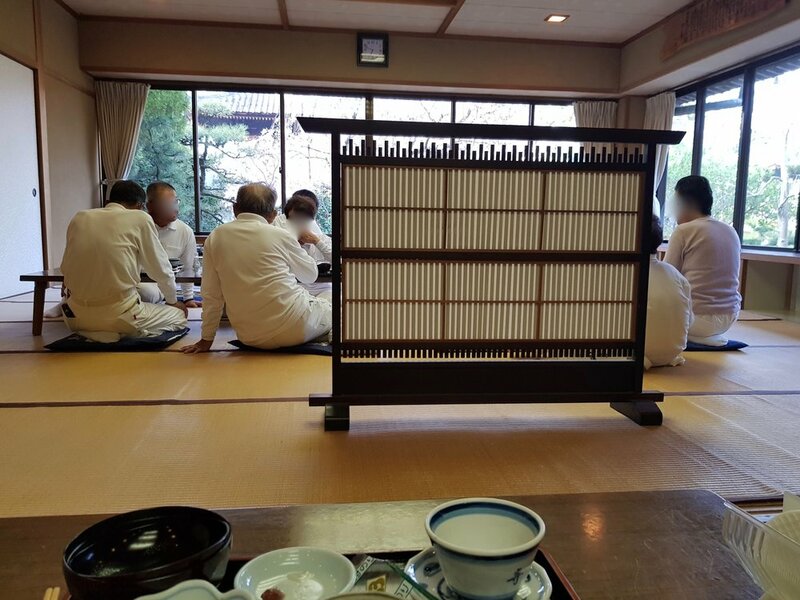 The rest of the time I stayed in minshuku (民宿 guest houses). In the minshuku, meals usually have meat or fish. If you have the chance to stay in a shukubo, I really, really recommend it. Just don’t complain about the food being vegetarian or the corridors being unheated!